Every dinner needs silverware, but when you've spent all day setting up and managing everything, the last thing you want to do is wash dishes. Our fine array of plastic cutlery is not only sturdy enough to take on the most robust food, but also looks great too. They are designed to look just like the fine cutlery you would see at restaurants, but without the price. Our plastic cutlery comes in several different options including gold or silver, packages of complete silverware or individual packages if you only need forks, spoons, etc. 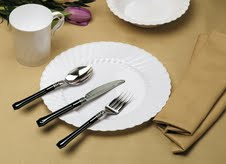 Don't get caught with bland silverware when you can save time, money and effort by choosing one of our sets.